Growing up, I didn’t eat many soups, which is ironic since I grew up in Cleveland where the weather is chilly. 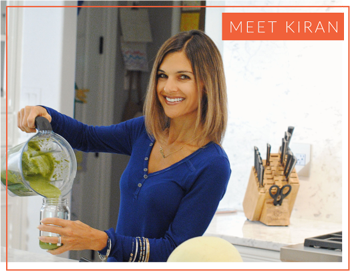 As I got older, I realized how much I was missing out – and now I’m a big fan of easy healthy soups. 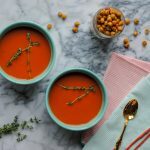 Today I’m sharing a new recipe which combines two things I love, with this Instant Pot Vegan Tomato Soup. So many tomato soups, like this one, contain unnecessary ingredients. I mean, high fructose corn syrup? Why?! And for those of us who need to be gluten free, many also contain wheat flour, or some unrefined version of it. At the end of the day, the main ingredients should be simple and full of nourishment. There’s no need for food names you can’t pronounce when a delicious meal is so simple. 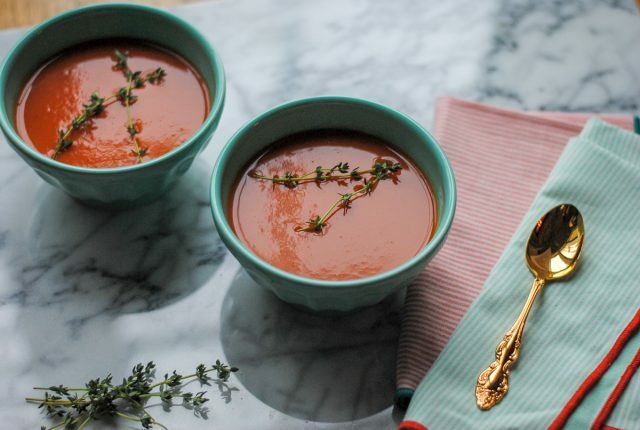 Since I’m lactose intolerant, I needed a dairy free tomato soup recipe, but I also made this version vegan for those readers who follow those ideals. I’ve listed swaps below to pertain to different diets! In case you are not familiar, the Instant Pot is a multi-device appliance that I’ve personally been using for 4 years. I recommend it for all busy families, or anyone who wants one appliance that can sauté, slow cook, make yogurt, cook rice, beans and soooo much more. If you don’t have one, check them out here; there’s a reason that over 31,000 people have positive comments on them on Amazon! Making healthy soups in the Instant Pot is a breeze. The fact that you can both sauté and then cook makes it simple, and clean up is minimal as well. I also need to mention that their customer service is top notch. I had an issue with my Instant Pot recently and called the company. I sent them a proof of receipt (from 3 years prior) and images and they sent me a brand new one. Just another reason why I love this appliance! An Instant Pot or multifunctional pressure cooker makes this a quick and easy soup to prepare. You’ll need to blend the final product in either a blender (I use this high speed blender) or by using a hand immersion blender, another appliance that I highly recommend. 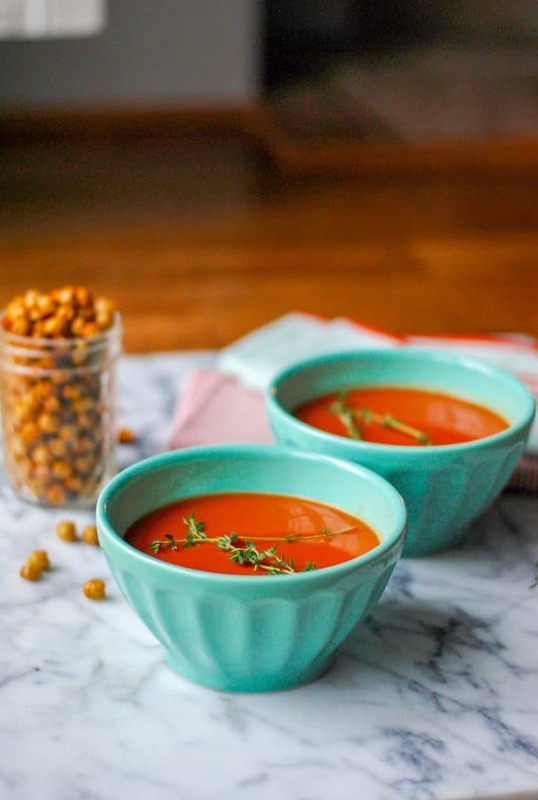 This soup is not on the heavy side, so I like including add-ins like organic sunflower seeds, roasted chickpeas, coconut milk or even cooked pasta to make it more hearty. Set Instant Pot to saute and add coconut oil/ghee/butter. Let warm until melted and add onion. Saute for 1-2 minutes. Add garlic and cook for 30 more seconds. Add flour and mix vigorously for 30-60 seconds, not allowing it to burn. Hit the Cancel button and add vegetable broth. Add remaining ingredients (not the toppings), seal the lid and set to Manual for 5 minutes. After time is up, let pressure release on its own for 10 minutes before adjusting valve to release remaining pressure. Dump soup (be careful it's not too hot!!) in a blender and blend until smooth. Alternatively, use a hand immersion blender to blend soup until creamy. Add toppings of choice; I like to add sunflower seeds and chickpeas, but my kids love it with cooked pasta. Don’t need it to be vegan? Swap out the coconut oil and use butter or ghee in its place. If you aren’t gluten free, feel free to use whole wheat flour instead. Not vegan or vegetarian? Chicken broth makes a great substitute for vegetable broth. 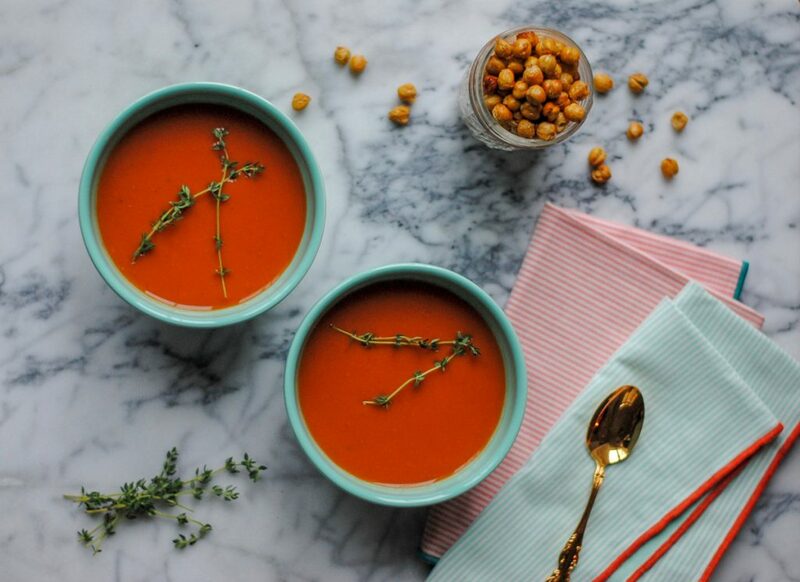 Don’t forget to check out these 20 other tasty soup recipes here that you may also like! Oh and if you’d like to make your own roasted chickpeas (so easy), try out this recipe. Enjoy!